Come to Jamaica and see Dunn’s River Falls. 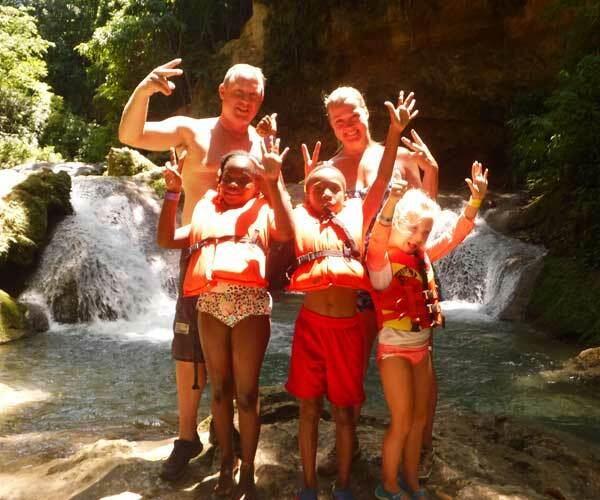 Tour the falls and visit Jamaica today. Our Jamaica tour operators will help you see this wonderful island and we are a highly recommended tour company with positive reviews. The falls are 180 feet (55 m) high and 600 feet (180 m) long. Our Jamaica waterfalls are terraced like giant natural stairs though some incorporate man-made improvements. Several small lagoons are interspersed among the vertical sections of the falls.The falls empty into the Caribbean Sea at the western end of an attractive white-sand beach. You Don’t Want To Miss Climbing The Falls! Let us be your tour guides and you will love every minute. Climb the waterfalls with the help of tour guides from the park. We will take you there from your Caribbean Cruise ship or your hotel room. Dunn’s River Falls is one of Jamaica’s national wonders. It is truly one of the most beautiful spots on the island.